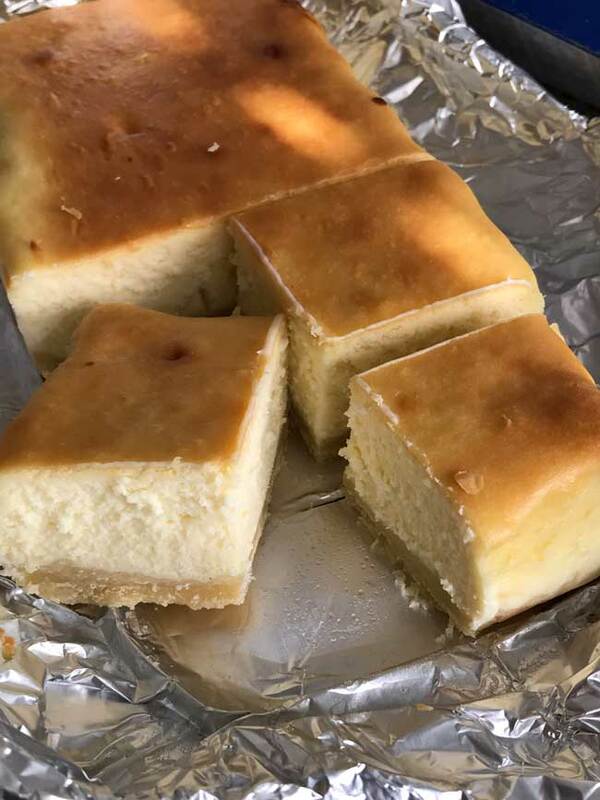 If you don’t make cheesecake as often as you like because you don’t need a whole cheesecake, consider making a loaf pan cheesecake. A 9×5 inch 8 cup capacity loaf pan is the perfect size for half a cheesecake. Not only will you get a smaller size cheesecake, but loaf pans are naturally water proof, so if your recipe calls for a water bath you don’t have to worry about sealing the bottom of a springform. 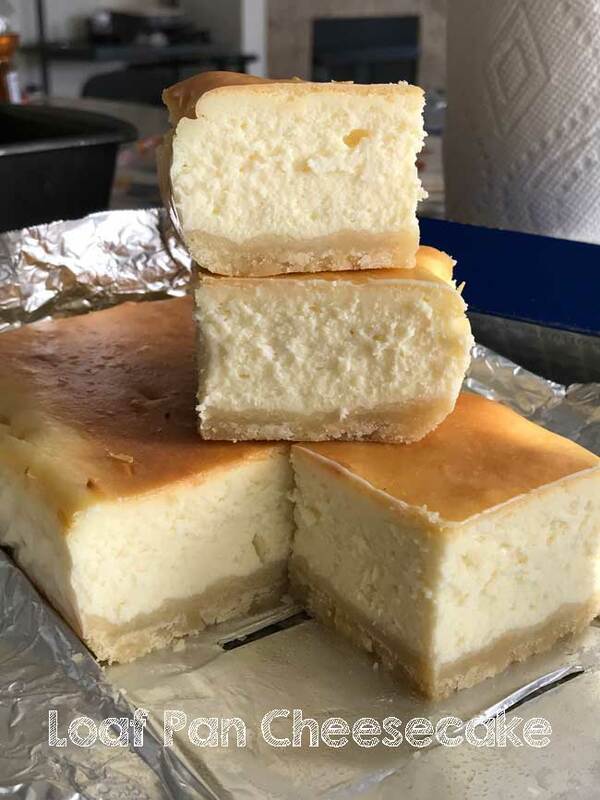 Also, loaf pan cheesecakes are easy to wrap and store, and because of their rectangular shape they fit neatly into even the most overcrowded freezers. This might not be a big issue for you, but it is for me! Our freezer is prone to avalanches when the door opens. Sigh. Over the years I’ve adapted different cheesecake recipes to fit in a large loaf pan, and this one is my very favorite. A spin-off of the famous Junior’s recipe, this is a dense, creamy New York style cheesecake with a lightly browned top. Plus it doesn’t crack! I’m not one to get too upset about cracks because they can be covered, but it does feel good to pull a crack-free cheesecake out of the oven. I’ve made this recipe plus variations about a million times and am looking forward to hearing how it works in other kitchens, so if you try it please let me know. If you do decide to make it, here are a few tips. 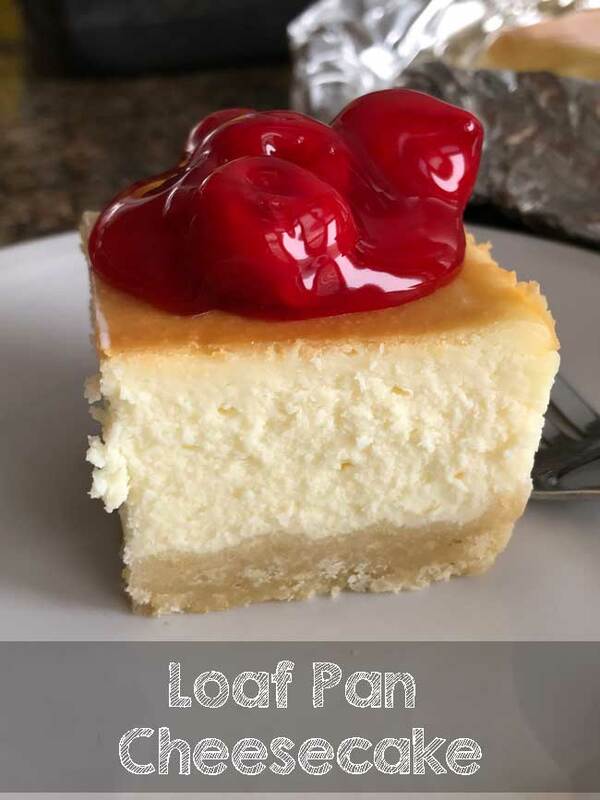 Loaf pan cheesecake can be made with either a graham cracker or shortbread crust. I prefer the shortbread crust because I always have the ingredients on hand to make it. Also, this is a really simple melted butter version that flies together. That said, I apologize for the “1/2 of an egg yolk” measure, but it’s really not a big deal. Crack the egg into a cup, scoop the yolk into a different cup and then spoon out half of it (the other half will go in the filling). The yolk in the crust helps keep it from getting too hard. To prevent lumps, make sure the ingredients are at room temperature without any sort of chill to them. You can leave the ingredients out or you can throw the cream cheese in the microwave on a very low or defrost setting. To bring the eggs to room temperature, let them sit in very warm water for a few minutes. 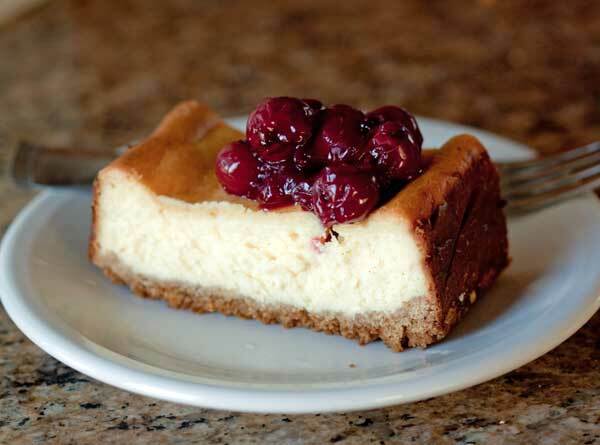 The cheesecake recipe is pretty simple and so is this topping, however you may not have Trader Joe’s cherries. If this is the case (which it often is for me), you can skip the cherry topping and just throw on a mixture of 1/4 cup sour cream mixed with 2 teaspoons sugar. This can be spread over the chilled cake and topped with any fresh fruit. Creamy and dense New York style cheesecake baked in a large loaf pan. For best results, use a loaf pan with an 8 cup (2 pound) capacity 9x5 inch loaf pan. Line the inside of a 9x5 inch (or just slightly larger) 8 cup capacity loaf pan with foil. Melt the butter in the microwave using 50% power so that it will melt gently and not be too hot. Partially melted is okay too. Allow it to cool a bit. Meanwhile, combine the flour, sugar and salt in a mixing bowl. Add the 1/2 egg yolk and vanilla to the melted butter and add to the flour mixture. Stir until blended, then press firmly into the bottom of the foil lined loaf pan. Chill for 30 minutes or until ready to bake. Bake the crust at 400 degrees F for 8 to 10 minutes. Reduce oven heat to 350. You will be baking the cheesecake at 350. Prepare Filling: In large bowl, with a handheld electric mixer at medium speed, beat half of the softenedcream cheese just until smooth; beat in half of the sugar, scraping bowl often with rubber spatula. Stir in the cornstarch until blended. Add remaining cheese and beat until blended, then beat in remaining sugar, lemon zest and vanilla extract. Add the eggs one at a time, beating on low just until blended (don’t overbeat the eggs), then beat in the ½ yolk, followed by the room temperature cream. Set the loaf pan in a 9x13 inch cake pan and fill with hot water so that it comes about half way up the sides. Bake in water bath for about 75 minutes. 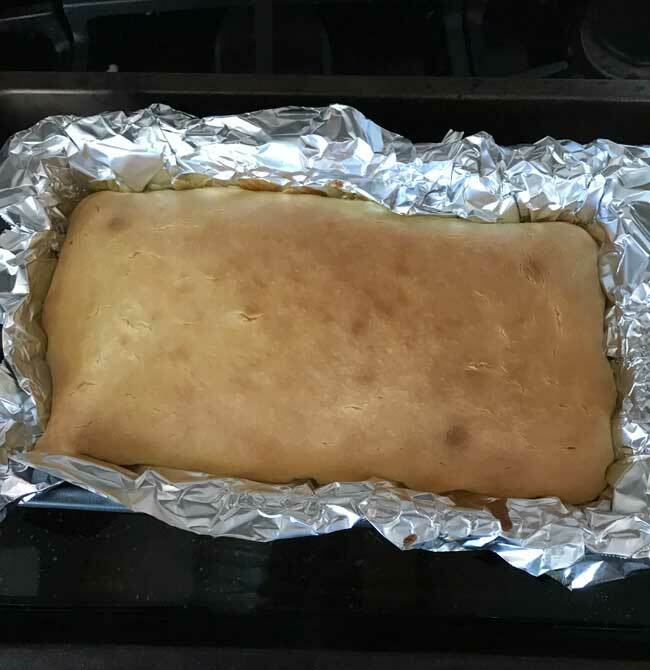 Cake should appear brown and smooth. Allow the cake to cool at room temperature for about 2 hours, then transfer to the refrigerator and chill for 6 hours or overnight. When ready to serve, lift the foil from the pan and serve with your favorite topping. To make the cherry topping, in a medium size saucepan combine the sugar, cornstarch and salt. Drain cherries and reserve 3/4 cup of cherry juice. Add the 3/4 cup juice to the sugar mixture and stir until smooth. Place saucepan over medium heat and whisk or stir until mixture boils, thickens and becomes translucent. Remove from the heat and stir in the drained cherries, lemon juice and almond extract. Mix together crumbs, sugar and butter. Bake at 400 for about 5 minutes. Thanks! My son has been begging me to make a cheesecake, but I dont trust myself with all of those calories. This is a perfect solution! Thanks Jen! I may try making a few other flavored cheesecakes using this recipe — maybe even Triple Layer Cheesecake with Chocolate Ganache. That’s one of my favorites but I hardly ever make it because it’s such a big cheesecake.